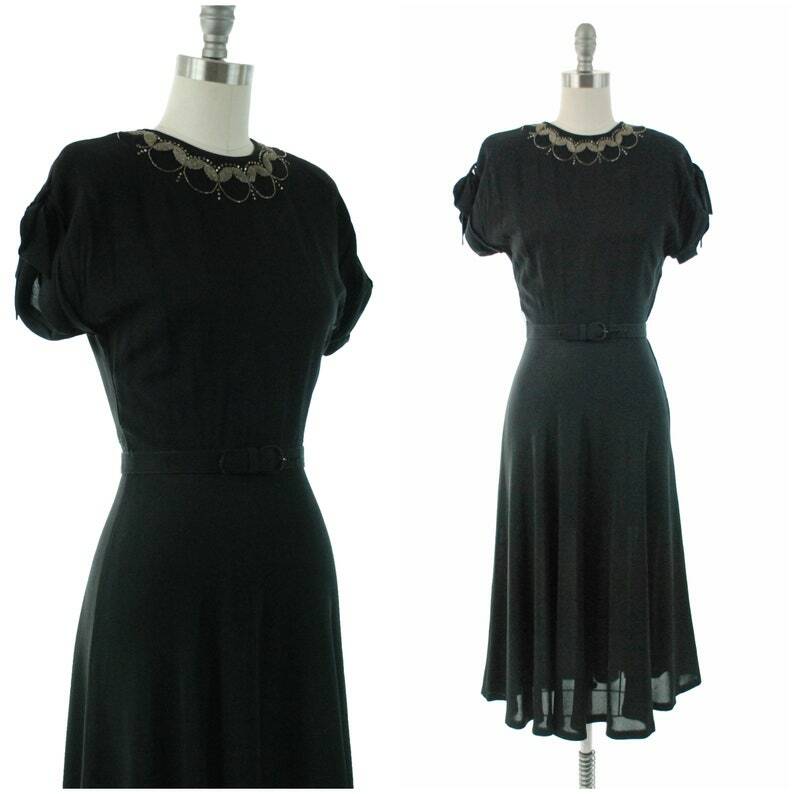 Vintage 1940s cocktail dress in a perfectly rayon crepe with fine texture and perfect drape. This piece is dramatic and sophisticated. The high rounded neckline is ringed with studded rhinestones, seed and bugle beads in a "necklace" of elegant circles. The short sleeves are of a piece with the bodice, becoming part of the draped fit. Loops of self fabric tie at the top. The skirt bias cut and flares to the hem. The dress closes with a two metal zippers, one on the side and one at the back of the neck. It still has the original self-fabric belt. This dress is clean and ready to wear. One inch of beads (about nine beads) is missing at the far left - I'm still digging through my supplies for a match to replace them, but as this is consignment I wanted to prioritze listing it. This dress presents beautifully, and I find no other issues to note. Just as described and very pretty.